Check out what makes Amana heat pumps from AVZ and ANZ series run efficiently and reliably and how the advanced features such as the ComfortNet increase the comfort and save money. When it comes to appliances and HVAC units, Amana is one of the top brands that you can buy. The manufacturer offers six models of heat pumps that come in a variety of sizes and capacities that will give you reliable heating and cooling in any season. The models range from the AVZC20 at the top down to the ANZ14. Amana heat pumps are made with a ten year parts warranty that gives you peace of mind that your new heat pump will last you year after year. They are also energy efficient models that may even qualify for a tax rebate – check with your local tax preparer for more details on how this may apply. The AVZC20 is the largest and it is the top tier model in the Amana line. With an exceptionally high SEER rating of up to 21 and a high HSPF rating of up to 10 to match, this is the single most efficient HVAC unit that Amana offers. The galvanized steel case gives this heat pump a very durable exterior. To increase its energy efficiency further, this unit features a variable speed swing and scroll compressor that can work at a highly efficient level and a ComfortNet control thermostat with LCD screen. This easily programmable thermostat ensures that you get ideal comfort for your home while getting the best savings on energy costs as well, and it can be combined with other items for the complete ComfortNet Communications System controlled by remote. It runs quietly - 57 decibels - thanks to the cover meant to reduce noise from the compressor made from special foam as well as a sound-dampening top. The variable speed ECM condenser fan motor also contributes to the lowered noise as well as the energy efficiency factor. Match your AVZC20 with other products like a variable speed furnace or air handler for increased efficiency. The proprietary nature of the inverter technology does mean your Amana heat pump will need to be installed by a technician who has passed an inverter certification. What is inverter technology you wonder? It takes the standard AC current your household runs on and switches it to DC current. DC is direct current, and as it is free of the fluctuations that often plague AC supplies, it is more reliable and stable. That translates into quieter operation for your heat pump and it also means you save on electricity. It only draws the minimum power needed to run the heat pump at the setting you desire. That current modulation also means it runs efficiently even on the hottest days without requiring a boost from an air conditioner, so this Amana heat pump can even be used in the hot south. Last in the Amana line but not least is the ANZ14. This model like the others is a high quality HVAC unit designed to offer maximum comfort as well as maximum energy savings. This unit also features a Quiet Condenser Fan single speed motor to ensure that this unit runs quietly and allows you to enjoy the comforts of your home with minimal noise pollution. It delivers a respectable 15 SEER cooling ratio and 8.5 HSPF heating ratio. Like its more expensive cousin, the ANZ14 comes with some great features to give you quiet functioning. It has been acoustically engineered to ensure lower noise level and peace at home. The top of the heat pump has sound controls built in and the fan motor on the condenser is made to run quietly. Copper tubing and an aluminum fin condenser coil mean you have some of great material quality for effective heat movement and durable operation. The ANZ14 uses non-Freon based R-410A coolant to ensure your new heat pump does no harm to the environment. SmartShift technology ensures that your unit will be able to shift to defrost mode quickly and quietly and an inline filter drier keeps your coolant free of dirt and water so it will give you years of service. 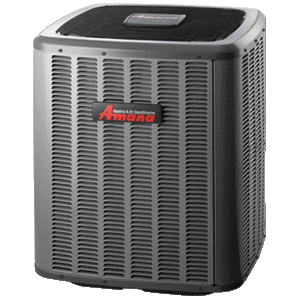 With industry leading warranties, some of the quietest heat pumps on the market, and advanced efficiency, it is little wonder the Amana brand is a respected HVAC producer. So if you need some of the best heat pumps on the market for your home or office, you can’t go wrong with heating and cooling your building with Amana heat pumps.